Definition at line 35 of file data.hpp. Construct an unsigned Data packet with given name and empty Content. In certain contexts that use Data::shared_from_this(), Data must be created using make_shared. Otherwise, shared_from_this() will trigger undefined behavior. Definition at line 35 of file data.cpp. Construct a Data packet by decoding from wire. 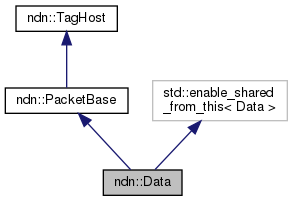 wire tlv::Data element as defined in NDN Packet Format v0.2 or v0.3. It may be signed or unsigned. Definition at line 41 of file data.cpp. Prepend wire encoding to encoder in NDN Packet Format v0.2. wantUnsignedPortionOnly If true, only prepends Name, MetaInfo, Content, and SignatureInfo to encoder, but omit SignatureValue and outmost Type-Length of Data element. This is intended to be used with wireEncode(encoder, signatureValue). Error SignatureBits are not provided and wantUnsignedPortionOnly is false. Definition at line 48 of file data.cpp. References ndn::tlv::Data, getContent(), ndn::Signature::getInfo(), getMetaInfo(), getName(), ndn::Signature::getValue(), ndn::MetaInfo::wireEncode(), and ndn::Name::wireEncode(). Referenced by ndn::security::pib::PibSqlite3::addCertificate(), ndn::Face::Impl::asyncPutData(), ndn::security::pib::detail::KeyImpl::getDefaultCertificate(), ndn::security::parse(), ndn::util::DummyClientFace::receive(), ndn::security::v2::KeyChain::sign(), and ndn::security::SafeBag::wireEncode(). Finalize Data packet encoding with the specified SignatureValue. Definition at line 93 of file data.cpp. Normally, this function encodes to NDN Packet Format v0.2. However, if this instance has cached wire encoding (hasWire() is true), the cached encoding is returned and it might be in v0.3 format. Definition at line 106 of file data.cpp. Decode from wire in NDN Packet Format v0.2 or v0.3. Definition at line 122 of file data.cpp. References ndn::Name::clear(), ndn::tlv::Content, ndn::Block::elements_begin(), ndn::Block::elements_end(), ndn::tlv::isCriticalType(), ndn::tlv::MetaInfo, ndn::tlv::Name, ndn::Block::parse(), ndn::Signature::setInfo(), ndn::Signature::setValue(), ndn::tlv::SignatureInfo, ndn::tlv::SignatureValue, ndn::to_string(), ndn::MetaInfo::wireDecode(), and ndn::Name::wireDecode(). Referenced by Data(), ndn::Link::wireDecode(), and ndn::security::SafeBag::wireDecode(). Check if this instance has cached wire encoding. Definition at line 108 of file data.hpp. Get full name including implicit digest. Definition at line 196 of file data.cpp. References ndn::Name::appendImplicitSha256Digest(), ndn::util::Sha256::computeDigest(), ndn::Name::empty(), ndn::Block::hasWire(), ndn::Block::size(), and ndn::Block::wire(). Referenced by nfd::cs::compareDataWithData(), nfd::cs::compareQueryWithData(), ndn::InMemoryStorage::insert(), and ndn::Interest::matchesData(). Definition at line 124 of file data.hpp. 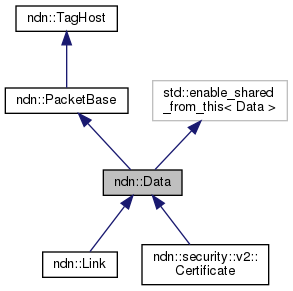 Referenced by ndn::security::pib::CertificateContainer::add(), ndn::security::pib::PibMemory::addCertificate(), ndn::security::pib::PibSqlite3::addCertificate(), ndn::security::v2::KeyChain::addCertificate(), nfd::fw::Strategy::afterContentStoreHit(), nfd::fw::Strategy::afterReceiveData(), ndn::Face::Impl::asyncPutData(), nfd::fw::asf::AsfStrategy::beforeSatisfyInterest(), nfd::fw::Strategy::beforeSatisfyInterest(), ndn::security::v2::Certificate::Certificate(), ndn::security::v2::ValidationPolicySimpleHierarchy::checkPolicy(), ndn::security::v2::validator_config::ValidationPolicyConfig::checkPolicy(), nfd::cs::compareDataWithData(), nfd::cs::compareQueryWithData(), nfd::pit::Pit::findAllDataMatches(), ndn::security::v2::Certificate::getIdentity(), ndn::security::v2::Certificate::getIssuerId(), ndn::security::v2::Certificate::getKeyId(), ndn::security::v2::Certificate::getKeyName(), ndn::security::v2::KeyChain::importSafeBag(), nfd::cs::Cs::insert(), ndn::security::v2::CertificateCache::insert(), ndn::Interest::matchesData(), ndn::MetadataObject::MetadataObject(), ndn::security::v2::operator<<(), ndn::operator<<(), ndn::operator==(), ndn::security::pib::detail::KeyImpl::removeCertificate(), ndn::security::pib::detail::KeyImpl::setDefaultCertificate(), ndn::security::v2::KeyChain::setDefaultCertificate(), ndn::security::signingByCertificate(), ndn::security::v2::Validator::validate(), and wireEncode(). Definition at line 217 of file data.cpp. Definition at line 138 of file data.hpp. Referenced by ndn::operator<<(), ndn::operator==(), and wireEncode(). Definition at line 225 of file data.cpp. The Content value is accessible through value()/value_size() or value_begin()/value_end() methods of the Block class. Definition at line 233 of file data.cpp. Referenced by ndn::security::pib::PibMemory::addCertificate(), ndn::security::pib::PibSqlite3::addCertificate(), ndn::security::v2::KeyChain::addCertificate(), ndn::security::v2::Certificate::Certificate(), ndn::security::v2::Certificate::getPublicKey(), ndn::MetadataObject::MetadataObject(), ndn::operator<<(), ndn::operator==(), ndn::security::verifySignature(), ndn::Link::wireDecode(), and wireEncode(). Set Content from a block. If block's TLV-TYPE is Content, it will be used directly as Data's Content element. If block's TLV-TYPE is not Content, it will be nested into a Content element. Definition at line 242 of file data.cpp. References ndn::tlv::Content, resetWire(), and ndn::Block::type(). Copy Content value from raw buffer. Definition at line 257 of file data.cpp. References ndn::tlv::Content, ndn::encoding::makeBinaryBlock(), and resetWire(). Set Content from wire buffer. Definition at line 265 of file data.cpp. Definition at line 185 of file data.hpp. Referenced by ndn::security::v2::Certificate::getExtension(), ndn::security::v2::getKeyLocatorName(), ndn::security::v2::Certificate::getValidityPeriod(), ndn::security::v2::Certificate::isValid(), ndn::Interest::matchesData(), ndn::security::v2::operator<<(), ndn::operator<<(), ndn::operator==(), and ndn::security::parse(). Definition at line 273 of file data.cpp. Definition at line 281 of file data.cpp. Definition at line 204 of file data.hpp. Referenced by ndn::security::v2::Certificate::Certificate(), ndn::MetadataObject::MetadataObject(), and ndn::Link::wireDecode(). Definition at line 289 of file data.cpp. Definition at line 213 of file data.hpp. Definition at line 297 of file data.cpp. Definition at line 222 of file data.hpp. Definition at line 305 of file data.cpp. Clear wire encoding and cached FullName. This does not clear the SignatureValue. Definition at line 210 of file data.cpp. Referenced by setContent(), setContentType(), setFinalBlock(), setFreshnessPeriod(), setMetaInfo(), setName(), setSignature(), and setSignatureValue().